Hi, girls! I hope you all are doing well. If you have a social media account and you’re frequently online, you might have probably encountered a lot of videos about beautiful nail designs before. 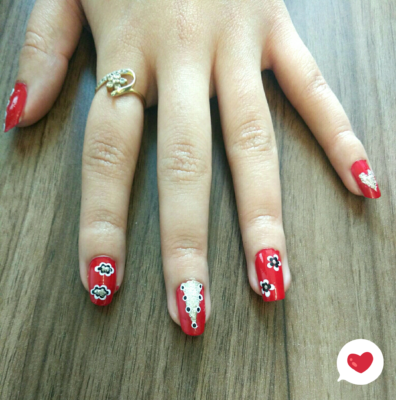 Those beautiful nail art are so popular that a lot of people become more interested in growing nails and buying different colors of nail polish. If there’s one thing I’ve found out about this trend is that you cannot achieve your desired nail design with just an ordinary brush and nail polish. Yes, you need the right tools if you want to have perfectly-looking nails. “Nail arts” are in so much trend these days and because I have been seeing a lot of video tutorials about creating gorgeous nail art, I decided to buy a nail art kit so I could do my own nail designs. Two days ago, I saw “Foolzy® 20 pcs White Nail Art Brush Pen” from Amazon. I immediately ordered it upon seeing the product descriptions and so happy because I received the product the next morning. It was fast, indeed. The first thing I liked about “Foolzy® 20 pcs White Nail Art Brush Pen“ is its price. I just paid around Rs 399 in India for it. This 20-piece set is less expensive compared to other products on the market. The second thing I liked about this product is that it comes with 2 completely different sets. 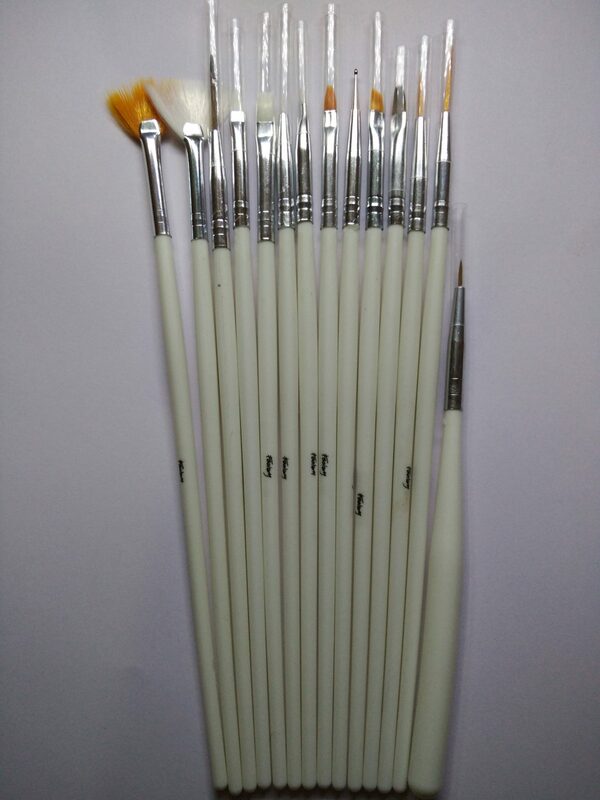 One set is for nail art brushes which include 15 nail art brushes like “stippling brush,” “flat brush,” “fan brush,” and lots of many others. 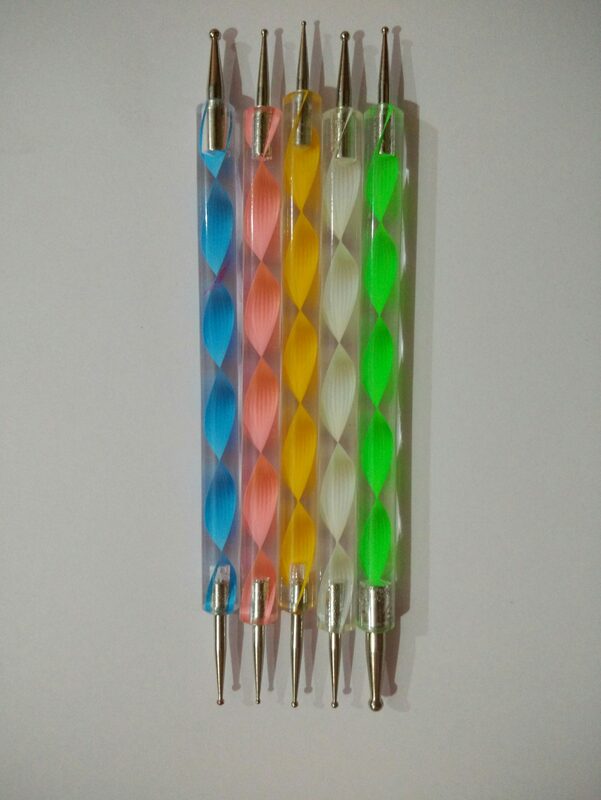 Moreover, the other set consists of dotting tools which include 5 types of dotting tools of different sizes. I am not saying that these brushes are similar to the professional nail art brushes which cost approximately Rs2000 or more. 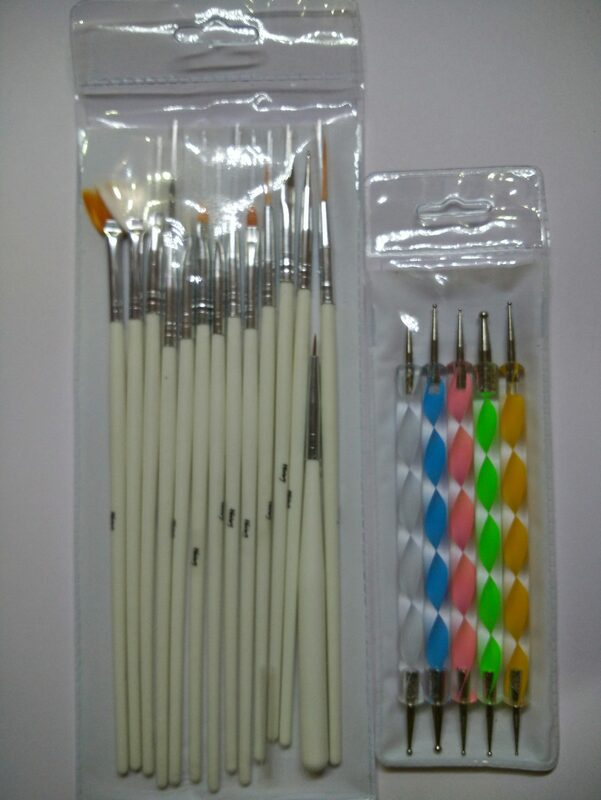 These are not fine brushes like the professional ones, but these are really good if you are a nail art beginner or you don’t want to spend a lot of money on nail art kits. It’s not easy to recognize the difference in sizes of the dotting tools, especially for the first-time users. The tools look similar to each other so choosing one over the other won’t make any difference at all. But if you’ll look closer, you’ll realize that they actually different in sizes and each tool is used specifically for a certain condition. 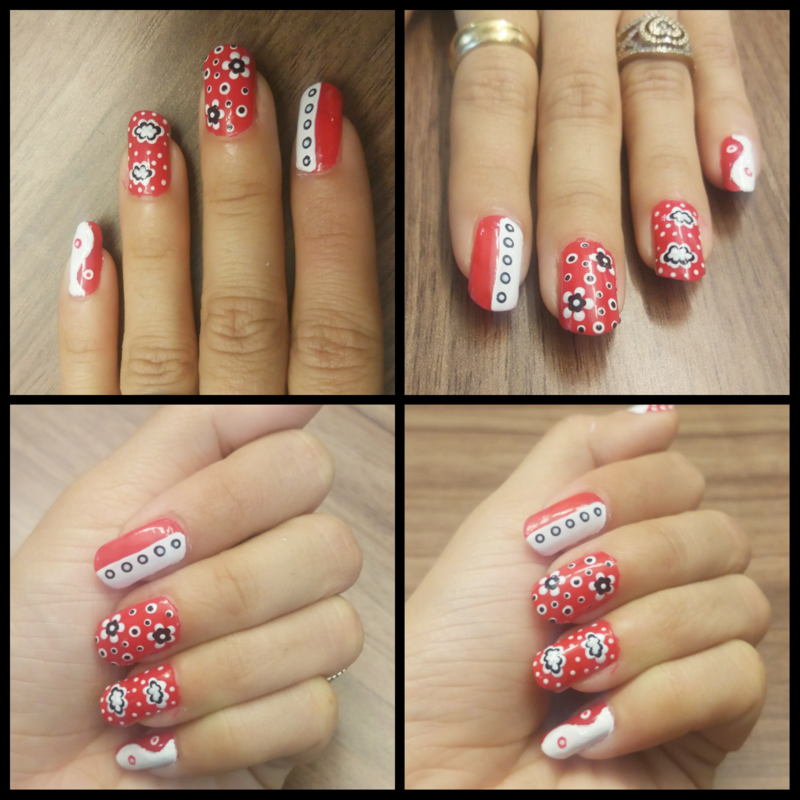 Beginners would think it’s just a waste of money, but once you start doing nail arts, you’ll eventually realize that each item is unique. Above all, it’s good to get two different sets at such affordable rate. The product comes with a plastic cover, so it’s easy to pack if you’re planning to travel and you want to bring it with you. Each brush also has a plastic cover making it safe from getting hard and dry. You can also put it in your makeup bag, it’s safely packed, so you won’t have to worry about mixing it up with your makeup brushes. Some of the bristles are of brown color, and some are of a white which contrast their color handles. Bristles are not as good as the professional nail art kit, but they are soft enough to help you achieve your desired nail design. The brushes pick up the right amount of the nail paint, and the handles are easy to hold and use. This is now my new favorite nail art set because it has everything I need in creating my nail design. I highly recommend this product to everyone, especially to the nail art beginners. This product is easy to use making your nail coloring more fun. You won’t also have a hard time figuring out how to use the tools because you can use them any way you like. These reviews are entirely based on my experience with the products and were not in anyway influenced by anyone. 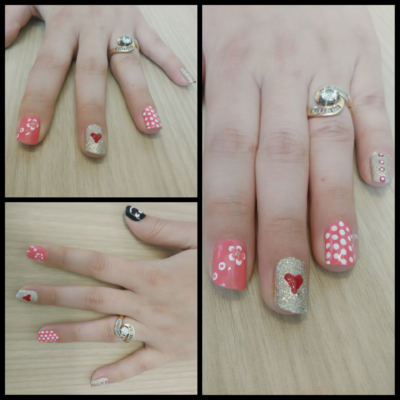 Few of my nail art looks which I made with the help of this set.